CyberLink has announced its annual update to the Director suite of video, audio, and photo editing applications (www.cyberlink.com). This is yet another impressive collection of applications -- both designed to accommodate beginners and family users, and also scaling up with professional-grade features for creatives and experts. The new releases are available for purchase (or upgrades) as individual applications, as before. New this year, CyberLink also is making them available by subscription, as PowerDirector 360, plus the full Director Suite 360 with all four applications (no longer available as a bundle for purchase). The subscriptions allow you to stay current with the latest updates, and also include full access to CyberLink plug-ins & effects, background music tracks and sound clips, AI Style Packs for video and photo editing, and 50 to 100 GB of cloud storage. As usual, CyberLink continues to pack impressive new technology into these products, and also make the magic accessible through the interface, often by analyzing your footage and automating the processing. CyberLink also continues to strengthen the collection as an integrated suite, with round-trip editing between PowerDirector and ColorDirector, AudioDirector and PhotoDirector -- for convenient color grading, audio clean-up and enhancement, and photo editing -- directly from the timeline. One highlight feature in both PowerDirector and PhotoDirector is the AI Style Packs. These take the idea of applying artistic looks to imagery and extends it to the next level with artificial intelligence processing. You can choose a specific artist's painting, and then can apply that style to your video or photo, down to the brush strokes and/or color tones. The first style packs for PowerDirector each include 10 popular paintings, with sets for Van Gogh, and for Impressionists (Monet and Manet), and are priced at $149. So let's break down the individual products, both to show the scope of what they do, and to discuss some of their new features. PowerDirector is CyberLink's flagship video editing and production tool, designed to scale from beginners to professionals, from smartphone cameras to action cams to pro cameras, and up to high-speed 120/240 fps video, 360° VR video, and Ultra HD 4K. You can start out quickly by building on the ready-made express projects, complete with effects, transitions, animations and music. Or you can drill in deeply with various separate modes or tool windows, including the action camera center, and enhanced design tools for titles, masks, subtitles, picture-in-picture, themes, and more. 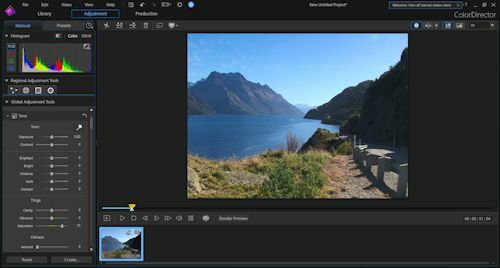 PowerDirector 17 adds a pile of new features, including video pre-cutting, frame-by-frame motion tracking, and better chroma keying with multiple key colors. 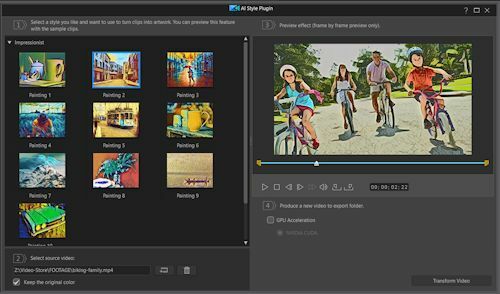 When working with multiple clips, use the enhanced multicam designer to synchronize and combine footage shot from different cameras, and the enhanced video collage designer to assemble a collage complete with animated openings and endings. And for more efficient editing, the new best matched profile features analyzes the source clips to help select the best-fit video editing profile. 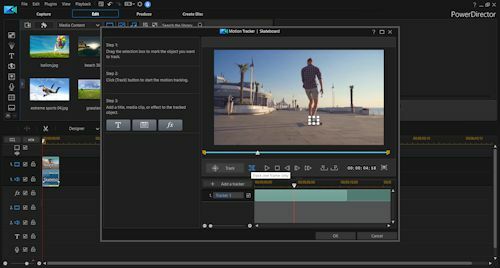 And the new nested video editing feature allows adding and editing multiple projects in the same video project. ColorDirector is a color grading tool for adjusting color and lighting in a clip, both to correct the color for a more natural look, and to change the mood or tone of the scene. This type of control is obviously not part of traditional consumer video products, but CyberLink has made it usable for beginners, and powerful for professionals. To get started quickly, ColorDirector offers presets that emulate the styles of well-known films, or you can design and save your own. To enhance the video, it has the dehaze tool to remove fog or haze, and automatic noise reduction for grain (luminance) and color artifacts. For more precise work, it includes precise selection masks and motion tracking to apply effects independently to foreground objects or to the background. The new ColorDirector 7 makes the presets adjustable by adding keyframe editing controls, and adds adjustment tools for both global tone level across the entire clip and regional tools for parts of footage. It also adds the ability to import and export look-up tables (LUTs), so you can match a look from one source to another. AudioDirector provides extensive pro tools for editing and fixing audio tracks, including vocals, backgrounds, and music. It already included extensive tools for audio restoration and adjustment tools including hiss, hum, and even plosive (breath) removal, plus sound expanders including a pitch bender, stereo expander, ambient background creator, and auto-fitter for background music track. 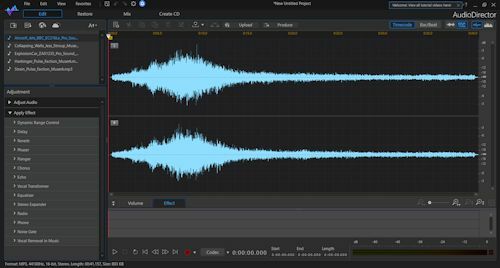 The new features in AudioDirector 9 include a spatial audio panner for 360° video soundtracks, track alternatives to add multiple tracks to a timeline and then quickly compare them, and batch processing to apply favorite effects to multiple audio files in one operation. PhotoDirector has a serious collection of pro-quality tools for photo editing that also make life easier for more casual users. It already included technology like the face and people beautification touch-up tools, the dehaze tool to clear out haze, fog, and smog, and content-aware editing to brush over an image to remove, move, or duplicate objects or people. 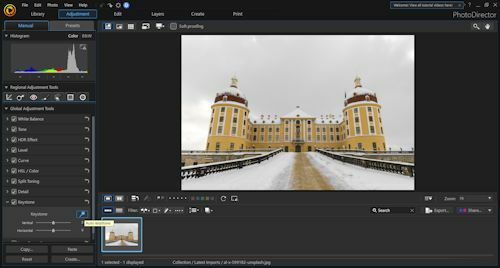 Then PhotoDirector 10 has significantly expanded its layers support, adding clipping and layer masks, adjustment and group layers, as well as Express Layer Templates to help assemble photographic effects. PhotoDirector also has added workflow improvements, including tethered shooting to shoot and preview while connected to the camera, and soft proofing of printer output to preview the color and tone rendering. CyberLink continues to impress with its Director suite of products, with lots more than can be covered here. If you're interested in trying them out, you can download free trial versions, and check out the extensive online tutorials and webinars, along with free customer-contributed content in the DirectorZone.